Roderick Smith is a BFA graduate of Rochester Institute of Technology. He has studied at the Art Students League and National Academy of Design in New York and at the Instituto Allende in Mexico. He and his wife Linda Miller are the creators of the nationally known and award-winning fabric sculpture known as “The Cadena Dolls.” Smith has had numerous one-man painting exhibitions in the Northwest. 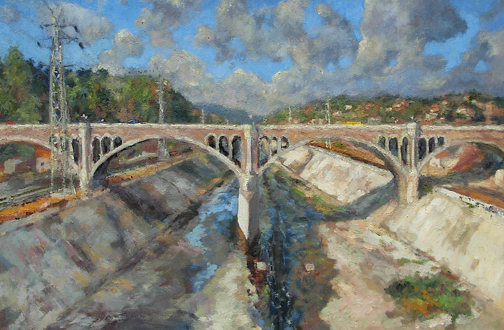 He is currently represented by the Broderick Gallery in Portland, Oregon, Catalina Artists Market in Avalon, and the Villa and Veranda Gallery in San Juan Capistrano. Smith developed his love of art from his grandmother in Pennsylvania who produced and directed fourteen years of outdoor theater in her community. She retired and took up painting in the 1950’s. Smith slept in her studio on childhood vacations. Here he was introduced to the sights and smells of a real working studio.